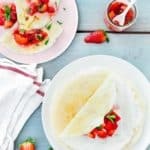 This Easy Eggless Crepes recipe is super easy to make and absolutely delicious! The batter allows you to get the thin crepe without them breaking. Savory and sweet version included. Plus, 17 Crepe Filling Ideas! In a blender, combine all the ingredients. Blend the mixture until is smooth and bubbles form on top, about 30 seconds. Let batter sit at least 30 minutes at room temperature or overnight in the refrigerator in an airtight container (whisk before using). Heat an 8-inch nonstick skillet over medium. When hot, lightly spray with non-stick cooking spray or butter. Add ¼ cup batter and tilt the pan with a circular motion so that the batter completely cover the bottom of skillet. NOTE: if you use a bigger skillet add as much batter as necessary to cover the bottom of the skillet, i.e. for a 12-inch skillet you will need to add 1/3 cup of batter. Cook until the underside of crepe is golden brown, about 2 minutes. Loosen with a spatula, turn and cook the other side, about 1 more minute. Fill as desired and serve, or store for later use. Don't miss my favorite 17 CREPE FILLING IDEAS (SWEET AND SAVORY) above 👆🏻. MAKE AHEAD: Prepare the batter and store in an airtight container in the refrigerator up to 1 day. STORE: Let the crepes cool completely. Place a square piece of parchment paper between each crepe. Place wrapped crepes in a sealable plastic bag. Store in the refrigerator for 5 days and in the freezer for 2 months.